Nervous markets again with US military positioning headlines for most of the session and that led to safety moves back into the JPY. Having broken the 111 handle early, next target was the 110 handle. Many did not expect the US trading hours to take it as far as it did (109.65 -1.1% last) levels that have not been seen since last November. Toshoba continues to be a hotly debated share after results been delayed twice already (today closed -2.7%). A mixed session for Asian cash trading with the risk off mood spreading across the time zones. Nikkei closed -0.3%, Hang Seng -0.7% whilst the Shanghai index closed +0.6%. Interesting that the PBoC skipped open (money) market operations again taking its void to 12 days in a row. Late in the US day Monday FED Chair Janet Yellen had said their plans still 2% inflation, full employment and gradual rate increases – almost settled markets more than anything else. European markets set a similar theme to Asia with DAX, CAC and IBEX all closing between -0.1% and -0.5% whilst the FTSE broke that mould closing higher at +0.2%. UK inflation released broadly in line, House Prices +5.8% after a January +5.3% all helped GBP make small gains against the USD. G7 talk has been quiet other than comments surrounding Russia and Syria. Financials across all indices collectively been heavy with more talk around regulations, the turn in Bond prices and the earnings numbers imminent especially as expectations are so high. Nerves continue as every rumour heard made dealers even more anxious. As France edges closer to elections so market volatility will increase. Not seen any new research poles but both sides of the spectrum are proposing EU referendums. 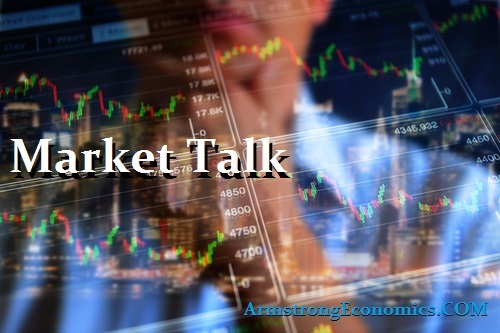 US markets saw the safe-haven trade accelerate which saw the DOW down over 100 points at one stage, only to see it claw its way back ahead of the close. With all majors closing small lower after the earlier losses has seen money taken off the table as far as Volatility is concerned. Many are discussing the spread between S+P cash and the VIX but did try to narrow that spread earlier in the session. The Trump trade is still being questioned but more talk today of regulation and tax reforms but still awaiting details. Banks remain heavy ahead of earnings but have lots to do to match numbers expected have much to do. The money flow continues away from Europe (FI)and back to the states/USD and has seen gold (+$20) and Treasuries (10’s at 2.3%) benefit on the back of these flows. 2’s closed 1.23% (+1bp), 10’s 2.30% (-6bp) 2/10 flatter by 7bp, Bunds 0.2% (u/c) brings that spread in 6bp to +210bp. France 0.96% (+4bp) election and referendum concerns, Italy 2.26% (+4bp), Greece 6.55% (-8bp), Turkey 10.69% (-2bp), Portugal 3.81% (+3bp) and Gilts 1.05% (-2bp).